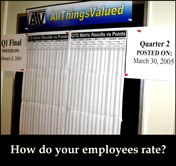 AllThingsValued is a 'relative' performance evaluation tool designed by "ATV" Principal John Carver. It enables call centre management to easily and precisely rank the overall contribution of the agents. Evaluation bias, subjectivity, and inconsistency are eliminated in an exact yet simple manner that will increase agent motivation, boost morale, and improve your call centre. Do a good job in assessing performance and you will have happy, motivated employees, eager to improve their own personal contributions resulting in the achievement of the company goals. Fail, and their dissatisfaction will manifest itself in turnover, absenteeism, complaints or just plain complacency. You often hear talk of best practices .... well, the AllThingsValued Performance Evaluation process received recognition as a 'Best Practice' from CC News and won the '2000 'ACCE' Award (Award for Call Center Excellence) for Innovation in a Call Centre from Teleprofessional Magazine. Accurate performance evaluation is critical to assessing performance, conducting salary reviews, and completing incentive pay distributions. These tasks are made simple by the AllThingsValued 'relative' performance evaluation tool which ranks employees' overall contribution from the best to the worst based on factors decided upon by you. You and your supervisors will complete reward and recognition evaluations fairly, consistently, and quickly, regardless of the number of employees. Most importantly, all supervisors will agree with the rankings, so you will never again hear agents complain of favouritism ... because agents have been ranked fairly and meaningfully. While AllThingsValued was primarily developed for call centre applications, it provides the flexibility to measure and rank performance using your priorities and data in any work environment where a large number of employees are doing essentially the same work. Have several team leaders/supervisors or whoever is responsible for the daily management of your agents complete and submit the attached challenge. Each team leader is to determine performance ratings for these ten fictional agents, using whatever terms your company uses to describe performance on your periodic performance review/appraisal. (e.g. excellent, exceptional, exceeds expectation … quality, competent, meets expectation … below quality, low competent, unsatisfactory, needs improvement etceteras.) In addition to assigning a performance rating, they have a budget of $3.50 per hour to award in annual increases, as they deem appropriate. They may give all to one employee, thirty-five cents to each, etceteras, but they are not to exceed their budget. Let us know by how many submissions we can expect. When the exercise is complete and all submissions have been received, we will analyze the results and return them to you, of course at no cost or obligation. If you would like to learn more about AllThingsValued, send us a note and we will be pleased to contact you. 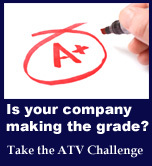 Click here for performance evaluation data and submit form.